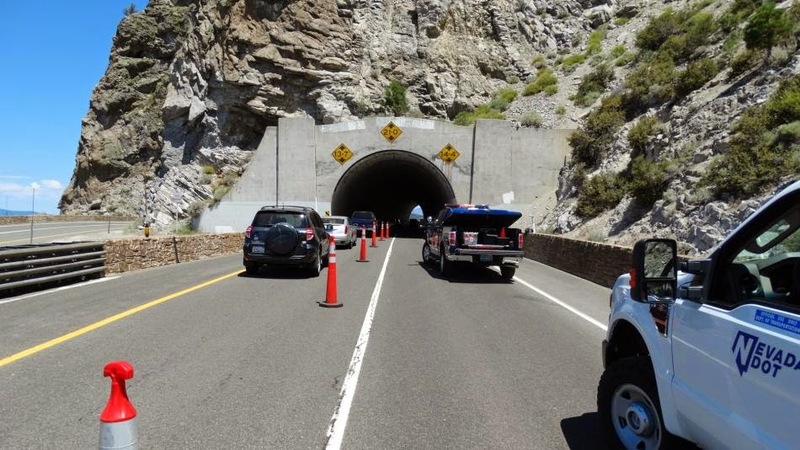 A 48 -year-old man from Bakersfield was riding his bicycle through the Cave Rock tunnel when he was struck by a tractor truck and trailer driven by a Carson City, Nevada man. The cyclist, Clarence M. Aldridge was flown by Care Flight to Renown Regional Medical Hospital in Reno where he remains in serious condition. Cave Rock tunnel during accident investigation. By NHP. Nevada Highway Patrol responded to the accident on Hwy. 50 at 9:50am on Thursday. The big rig and the cyclist were traveling eastbound in the tunnel when the accident occurred. Richard Pettay, the driver of the big rig, reportedly didn't see the cyclist. He hit the bicycle with his tractor truck and threw Aldridge to the roadway. Pettay stopped his rig just outside the tunnel. The Cave Rock tunnel is a narrow two lane road that is relatively dark with a posted speed limit of 35 mph. I have ridden through this tunnel several times over the years and each time I go through, the experience is unpleasant.